The last days of a 4-month long, 4-country travel stint in Latin America winding down, I got off the bus last week with my son and his girlfriend in the small community of Puerto Lopez, Ecuador, a village of 16,000 in the middle of the country’s Pacific coastline. 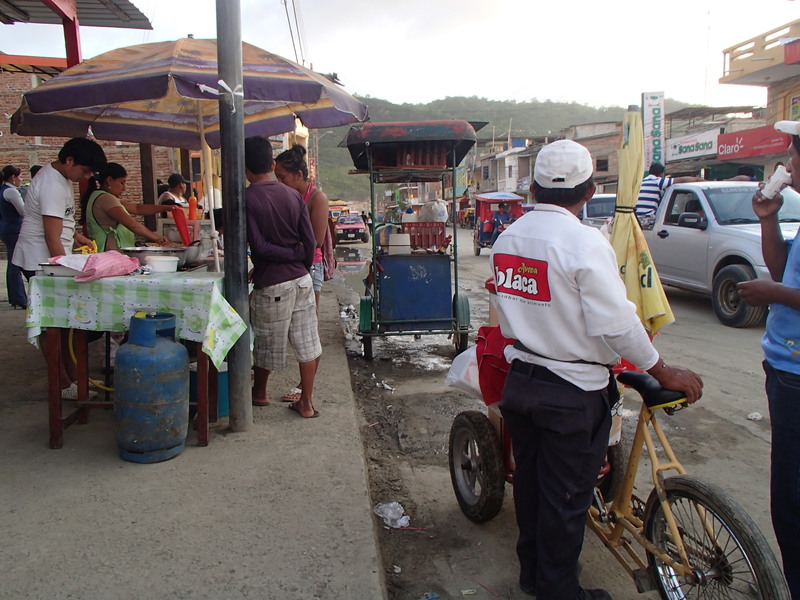 The “centro” bus stop in the village was a dusty and bustling intersection – the towns’ only traffic light did little to bring order to the chaos of pedestrians, motorcycles, pickup taxis, buses, and bicyclists that rambled though, a seemingly constant precipice walk of accident avoidance acted out at an appropriately slow Latin American pace that was controlled by speed bumps along the main highway road through town. Three-wheeled moto-taxi’s immediately swooped in to “spare” us from having to walk the two blocks to the ocean to start our hostal creep to find beds for the night. We gave the first few an amused “No gracias” and then ignored the rest. Instead, we turned to our usual first item of business whenever we size up a new town – scoping out the street vendors and finding the public market. Vendors and their real estate on one corner of the main intersection. The guy in the white sold avena, an oat drink, from a cooler on the front of his bike. He would be in this spot from early morning until evening, every day until he sold out. A short introductory walk through a towns market is like reading the prologue to a novel. It suggests if the book is worth reading, sets the scene, and hints at the richness of the storyline about to unfold. The market is the life blood, the personality, the sense of humor, and the disposition of a community and culture. 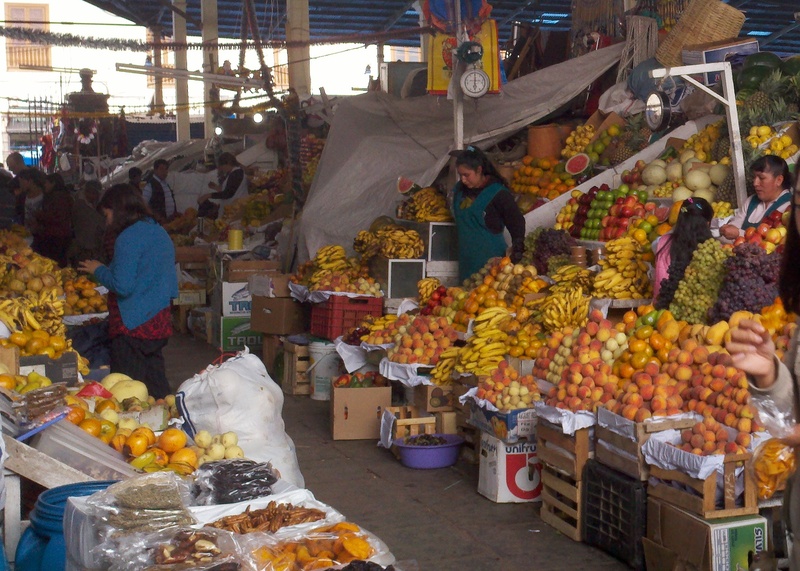 A Latin American market is the place to get the usual fruits and vegetables, grains, fish, and all types of meats. Beyond that, indigenous crafts, shamanic healings, fireworks, new shoes, pool toys, a haircut….a huge choice of basic and not-so-basic necessities. It’s also the place to get the scoop on towns goings-on, directions to just about anywhere, or recommendations from the locals. In countless villages and cities throughout Latin America, the market is where a community wakes up, with vendors and suppliers long at work before the sun rises, transporting, bartering, and organizing. The market in Puerto Lopez was a pretty simple one. It was a no-frills shantytown, with tables, roofs, and walls made up of a ramshackle mix of tin walls, bamboo posts, tarps, and a variety of obviously salvaged other materials. There were a variety of fruit and vegetable vendors, one corner dedicated to ceviche, and another corner dedicated to breakfast and lunch. In a fishing village like Puerto Lopez, this meant smiling soup ladies wielding ladles with abandon, scooping out hefty portions of fish soup, followed by hearty fish stew over rice, with plantains and a little salad, and plenty of aji sauce on the side to spice it up. Soaking up the Soup in the Puerto Lopez Market. There were vendors selling yucca bread and corn bread with cheese stuffing, empanadas, coconut water, avena drinks, medicinal “street” teas, ice-cream, various meat-on-a-stick creations, and more, everything in dollar or less portions. The market in Porto Lopez wasn’t winning any prizes for presentation or abundance in my book, but it passed muster. It was clear we’d be spending our meals and snacktimes here, dropping single dollars into plenty of different pockets, and splurging a full two and a half dollars when we felt up to a complete meal. One feature of long term travel is that, for better or worse, it almost guarantees that a traveler will encounter real life. Unlike a vacation, where for brief glorious stretches, we escape from the realities of the real world often into excesses of food, drink, and entertainment, long term travel is really just ‘life’ on the road, and life is ups and downs, delights and disappointments, surprises and routines. Travel for me includes pausing to look deep into the eyes of the oldest residents and getting glimpses of life experiences and stories etched into wrinkled skin. Throughout most of Latin America, those plotlines often weave through close family and friend connections, basic living conditions, long hours of hard work, and all-too-often harsh realities of political and social persecution. 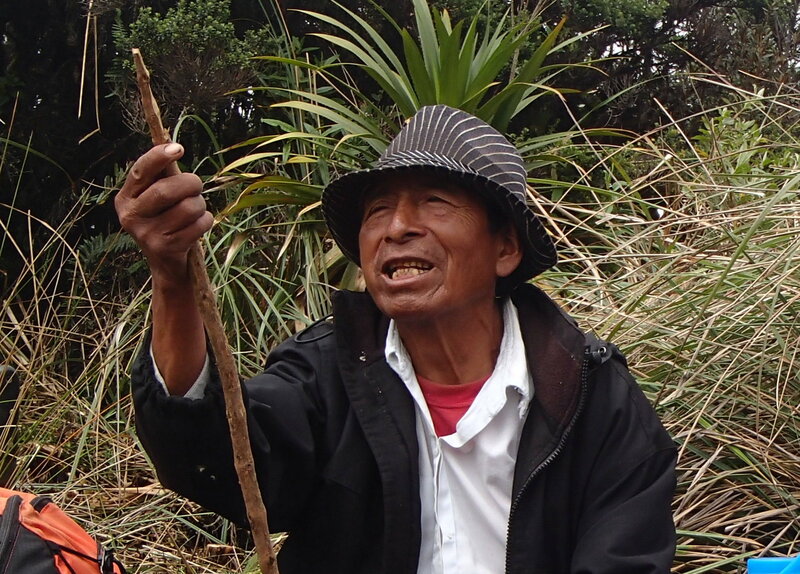 A Priceless Moment – Story Hour with an Indigenous Elder in the High Andes. During my time in Puerto Lopez, being a traveler meant being “present and aware” as a piece of the community fabric was trampled and torn into oblivion. Two days after we got off the bus and bought our first plantains and avocados, the market was a frenzied scene of backhoes, angry residents, law enforcement, and shocked and crying vendors. Word passed around quickly. The newly elected government had decided that the public market was the best location for a new government building. It had, unfortunately, failed to tell the public, and decided that just showing up and beginning work constituted a reasonable approach. This was “Shock and Awe” applied at the level of one city block. Police in full riot gear and shields were on trucked in by ridiculous numbers, no doubt to make sure the ladle-wielding soup ladies didn’t turn on the defenseless backhoe operators. Sorry no pictures of the craziness – out of respect for how upset the people were, we left our cameras in our bags. I’ll shoot for Pulitzer-prize photos documenting other peoples’ agony the next time. In hastily arranged meetings, the market public was informed that a new location would be set aside at some unspecified date in the near future…one that was likely to be on the edge of town, far from the tourist center, and one that obviously would be an inconvenience, and an affront, to much that a market represents with regards to being a center of social activity. Two blocks away, the vast majority of vacationers had no idea that anything had changed in Puerto Lopez. They went about their busy days, lining up boat tours to Isla Plata (the poor mans’ Galapagos), or ordering their next rum drink. 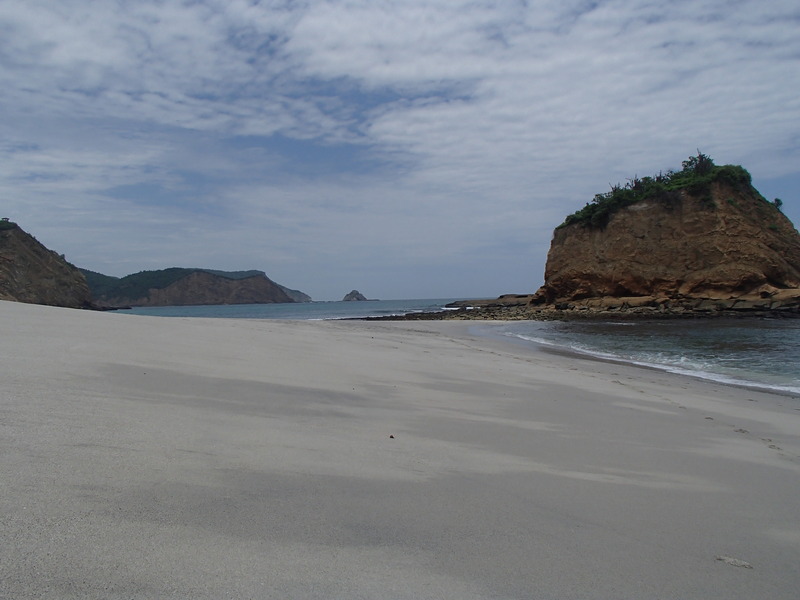 With beaches like these at nearby Los Frailes, Puerto Lopez has a bright future in tourism. On one hand, I could understand the possible thinking of the towns’ leaders. Puerto Lopez is, after all, an up and coming vacation destination in a country that’s opening its doors wide to retired expats and international tourists. The whole country seems like its undergoing a bit of a face lift. I saw an amazing number of road construction and building projects over my three weeks in Ecuador in 2013. The new international airport outside of Quito opened while I was there, and major attractions like Cotopaxi Volcano Park are being buffed. Far from being a problem, it’s nice to see a government putting government revenues (largely oil related here in Ecuador) to use for the benefit of the country, instead of into the pockets of multinational corporations and their investors. There inevitably are costs to this development, and there are hints that Ecuador is succumbing to some of the general guidelines for acceptance on the road to “development.” This road often includes shuffling the poor more to the fringes, and hiding your garbage and pollution better, but not necessarily dealing with it. Vacationers and retirees tend to like clean streets and nice store fronts. It’s just a hunch, but markets like the one in Puerto Lopez are untidy places that make some tourists feel uncomfortable, and this may have at least partly been behind the local governments decision to locate the new building directly over the public market. Money is exchanged at these markets in a fashion that’s impossible to track….there are no cash registers or receipts. The government does not get a cut, and in comparison there are tax revenues generated by established and sedentary businesses. Even with that line of reasoning, though, destroying a public market like the one in Puerto Lopez still doesn’t make much sense. Larger and more established tourist destinations around the world have embraced their markets, and have located or allowed them to be located in prominent central locations. The lessons that many larger communities seemed already to have learned, seemed to have escaped the wise leaders of Puerto Lopez: a market is critical to residents who live on very small wages, and it’s optionally attractive to a large portion of tourists who just dig that kind of thing. The “After” Shot of the Puerto Lopez Market. After two more days, an uneasy calm had set in over the market area. The back hoes had completed the initial demolition and had for the time-being been pulled out, and the riot police were gone. Tin walls were up around three sides of the work area. Some residents were still picking through the debris piles to salvage whatever they could for whatever building project they were working on. On the outside of one wall, “new” shacks had gone up, and vendors were slowly prepping them for business – even if temporary because there was no way to know if the local officials would tolerate temporary stalls. A heap of half-burned tires smoldered in the middle of one of the streets, and people on the surrounding block chatted idly, pointing to this or that around the site. The list of current major social and humanitarian disasters around the world is a long one. I won’t get to see firsthand the unimaginable hardships of life for an Iraqi citizen of Baghdad since the destruction brought on by the Gulf War, or ethnic killings in Mali, or the frustrations of an out-of-work Greek victim of austerity measures. 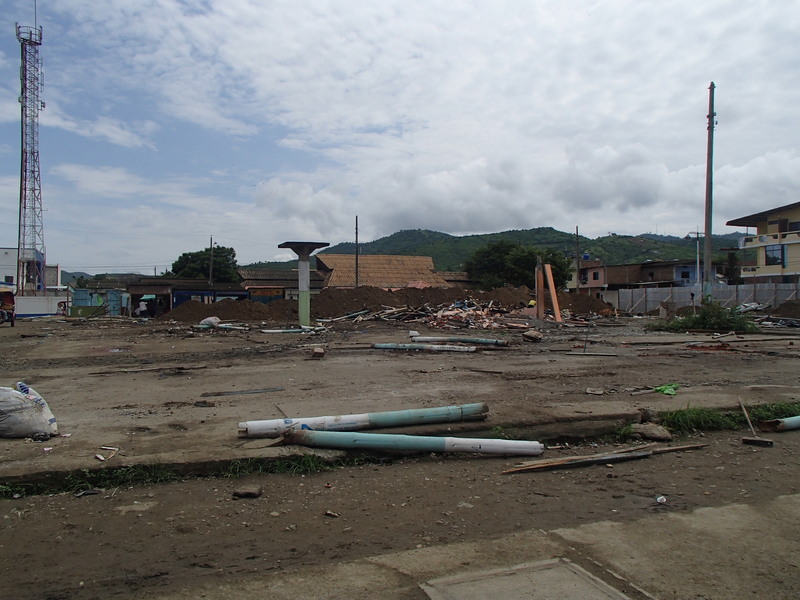 In comparison, the destruction of a small public market in the 16,000 person community of Puerto Lopez, Ecuador, may seem like insignificant small potatoes. But in the faces of the residents of Puerto Lopez, it was evident that this was like having a vital organ involuntarily removed. For me, it was stark reminder about the importance to not let ourselves be steam-rolled by government that all too often is working in the interests of those other than the everyday people. Accountability needs to be non-negotiable. Four days later, the three of us loaded onto a bus heading north, leaving a community that was much edgier than the one we had first encountered. I have no doubt the public market will be resurrected in Puerto Lopez – like the ocean fish that feed the community, the market is a basic staple of life that’s just too ingrained to take away. It’s possible the large public outcry will lead government officials to include their voices in the next phases of planning, including picking the site. The former market location may very well be the best location for the new government building, and the new market may very well end up being a nicer place that both locals and tourists enjoy. It’s likely a certainty that continued loud outcry and involvement by the vendors and everyday customers will be necessary for this to happen. 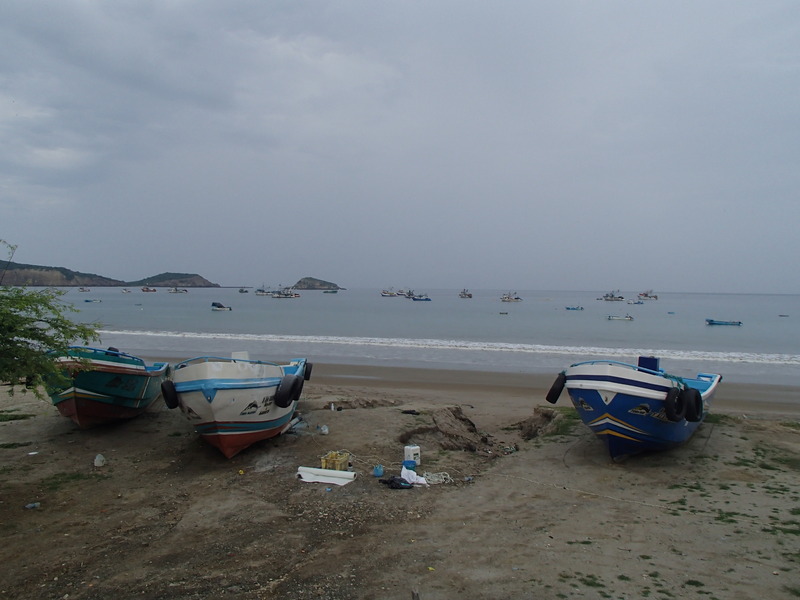 The Puerto Lopez Fishing Fleet. Hell yeah, that’s how things work in Amer… I mean, that’s how things are supposed to work in…. Well, damn. As I rode the bus north and started the two day long trip that eventually would take me back to the states, a jumble of ideas swam around my head for acting in response to all the “Puerto Lopez Markets” being crushed back in the states from the community to country level, ranging from cuts in social and community programs, environmental issues, misuse of public funds, and more. I had calls to my congressman to make, letters to the editor to write, planning board meetings to attend, everyday decisions to make on how and what I would spend my money on. Things that can, and do, bring about real change. Agitate, agitate, agitate…..constructively of course. I don’t have a public market to fight for, but I have plenty of other issues that I care about, and one thing is for sure…keeping quiet will leave me and the other “every-dayers” just as steam-rolled as those soup ladies in Puerto Lopez. First things first….I need to get me an extra big soup ladle…. hi — know absolutely nothing about Equador, but met a person who just retired to Puerto Lopez, so thought i would check out whatever information is ‘out there.’ thank you for your posts! Hi Valerie, thanks for stopping by at Puma Diaries, and leaving a comment. I’d love to hear how that person is doing after a while. There’s alot to like about Puerto Lopez.